After a 162-game—or in this year’s case, 163-game—marathon season, the Major League Baseball playoffs are finally here. Even if you haven’t followed the action incredibly closely this year, there are plenty of story lines to latch onto. Can the young Yankees team return to their home run hitting best? Even if they can, will it be enough to get past the Boston Red Sox, who have dominated the league all season? In the National League, will one of the blue blooded Los Angeles Dodgers make a run to the World Series? Or will a team like the Colorado Rockies or Milwaukee Brewers get their moment in the sun? The only way to find out, of course, is to watch. But if you’re a die-hard fan itching for some postseason action, there’s nothing like scoring a seat in the stadium to watch your favorite team in action. In the American League, the Divisional Series will feature the New York Yankees vs. the Boston Red Sox and the Houston Astros hosting the Cleveland Indians. When two of the biggest rivals in sport meet in the postseason, the ticket prices will be high; the first ALDS match-up is no exception. 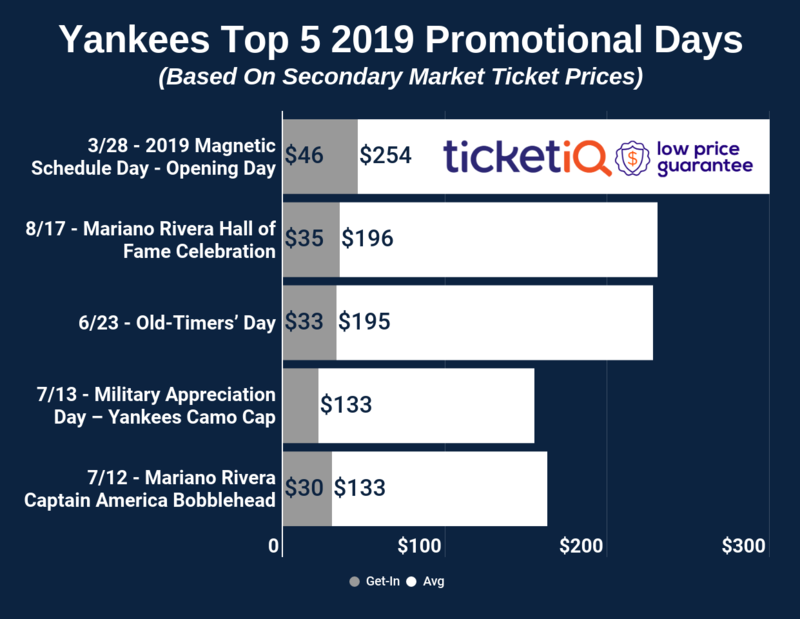 The average secondary market ticket price for the series is $396, with games three and four in New York being slightly more costly than games one and two in Fenway. Unsurprisingly, the potential deciding game five is the most expensive, though, with average secondary market price of $461. While the market will move depending on the result of each game, right now game one is the best bargain. While the average price on the secondary market is $343, you can get into the building starting at $118. If you’re confident that the series will reach a fifth game, you could also gamble on a ticket to game five; the cheapest seat in Fenway for the potential decider starts at $131. In the Houston-Cleveland series, a clear trend has emerged: games in Texas are significantly cheaper than those in Ohio. 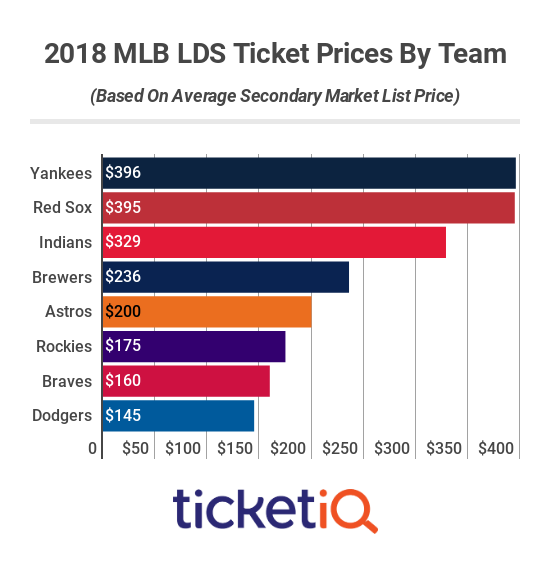 On the secondary market, game one has an average price of $166 and a get-in price of $56; for game two, the average price is $215 and the cheapest available seat is $78. Even game five, should the series get that far, has seats available as low as $74. On the opposite side of the spectrum, both games in Cleveland are much more expensive. Game three has an average secondary market price of $333 and a get-in price of $190; game four is a little cheaper with an average price of $325 and a get-in price of $143. After two tiebreakers and a Wild Card game, the National League has finally settled. The Milwaukee Brewers will host the Colorado Rockies while the Los Angeles Dodgers holds home field advantage for their series against the Atlanta Braves. While neither series can match the ticket prices of the American League match-ups, they do provide some bargains for the savvy baseball fan. 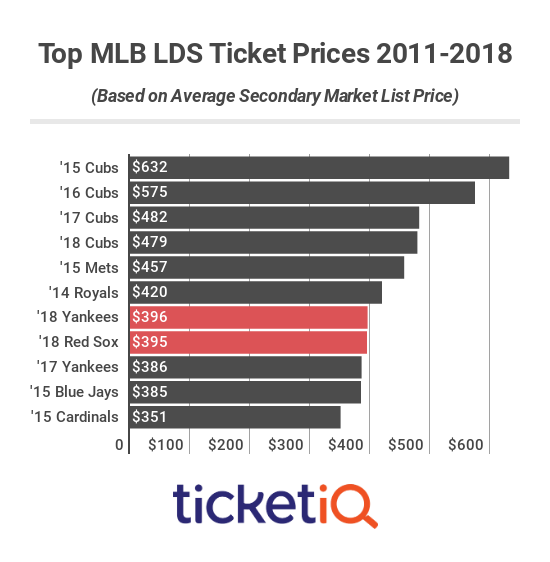 In the first series, tickets in Milwaukee come at a higher price on the secondary market averaging $236 on the secondary market compared to the Rockies’ $175. Games in both parks also offer affordable get-in prices. The cheapest available seat at three of the five games is less than $100; the two that break the century mark are only $108 and $115. The Dodgers-Braves series, however, provides even better deals. On the whole, the average ticket price on the secondary market is only $151, but even that number is inflated; game three in Atlanta (averaging $192) and game five in L.A (averaging $186) drive that number up. Looking at the cheapest available ticket price for each game—$ 35, $59, $105, $44, and $48—should tell you all you need to know about demand for the series. Historically, there is one common thread when it comes to the most expensive divisional series: the Chicago Cubs. The three teams with the most expensive divisional round tickets since 2012 are the 2015, 2016, and 2017 Cubs; this year’s team would have joined them, had they made it to the second round. Beyond the Cubbies, the most expensive series either feature teams that are in major markets or teams that hadn’t seen postseason success in several seasons. This season’s Yankees and Red Sox make the cut, alongside teams like the 2015 New York Mets, 2014 Kansas City Royals, and 2015 Toronto Blue Jays.